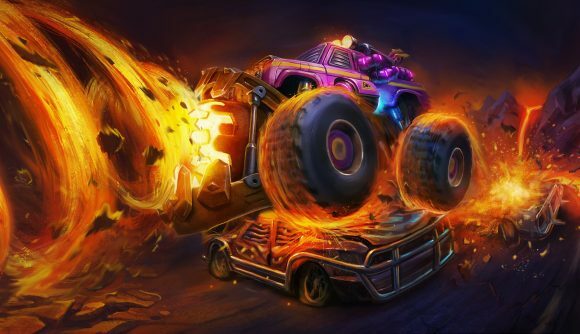 Free games: Win a Steam key to unlock goodies in racing MOBA Heavy Metal Machines! What happens when you combine heavy metal and violent vehicular racing? Heavy Metal Machines, that’s what. It’s a clash of genres – MOBA and combat racing – that is soundtracked by heavy metal; vicious guitar riffs, throaty howls, and machine gun drumming. If you’re old and have a few wrinkles you may think Heavy Metal Machines sounds a bit like Rock n’ Roll Racing, and you’d be right. In fact, it actually has that game’s narrator, Larry Huffman, contributing his voice. But it’s more than a spiritual successor, as the creators of Heavy Metal Machines have esports ambitions, with several character classes and a few different arenas for you to master. The idea is for you to drag a large ball across a race track and get it into your opponent’s goal. So, think a bit of Rock n’ Roll Racing combined with Rocket League and League of Legends. Bit of a mishmash, but hey, it works, and it’s great fun to play. No need to take our word for it, though, as Heavy Metal Machines is a free-to-play game that’s available to download on Steam right now. Handy information, that, but we can do one better than impart knowledge. Yes, we’re doing a giveaway for Heavy Metal Machines, one that unlocks some goodies in the game. That includes a couple of characters, two skins, and an experience booster that last for three days once activated. If you want to be in with a chance of winning one of the 100 Steam keys we have for Heavy Metal Machines then you need to enter the competition via the widget below.